At the SNIA blogfest in Australia, John Martin presented for NetApp. I caught up with John and recorded this quick interview afterwards to get a summary. I posted the interview with Craig McKenna from IBM on XIV. Here is more of the details from the SNIA Blogfest event this past week. First off Craig went through the XIV, which there has been a bit of talk about in the industry. 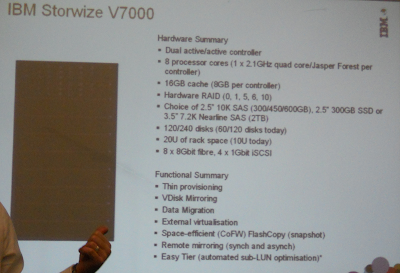 Here is his slide on the specs. It comes in its own rack. It is built up from modules, each which hold 12 SATA drives. 6 modules also contain the FC (4G) and iSCSI (1G) interfaces. Internally the backplane uses 1G Ethernet. Each module has four connections. You can start with 6 modules, which gives you 72 disks. Maxed out at 15 modules you will have 180 drives. You need to pick a standard drive size across the entire rack, it only has one tier, full stop. Either 1TB or 2TB drives. You can't match drives, if you do the additional space in the larger drives is not used. Once you have all of the drives in at the larger size, you do get the space as it rebuilds/re-levels. I don't think you can mix drives sizes within a module. Over the lifetime of the machine I wonder if customers are going to want to get the benefits of larger drive sizes. Hopefully they will have a great relationship with their IBM sales rep and can get them to trade in their old drives. Its a result of the architecture but if an XIV was the only storage on your floor it might not be flexible enough for you. With the smallest drive and smallest number of modules you starting point is 27TB. The largest capacity you can go to is 161TB. These figures are for usable space after loss of data protection (mirroring) and sparing (not disk based) is factored in. The read architecture makes the SATA drives perform close to FC speeds. The controllers use a grid architecture, all can access and service data at the same time. The cache is 240G (depending on number of modules). It is always doing thin provisioning but you don't have to over provision. You can put your XIV in front of your existing storage (disruptive to get it into the data path) and then get it to ingest existing data to conduct data migration. Redirect on write is used used for snapshots, similar to Netapp but unlike Netapp the snap data is independent and resides outside of the volume. You can do up to 16000 snaps. Async Replication is based on snapshots (not my favourite method). In the future you will be able to connect multiple frames (racks) together and these could have different drive sizes. Infiniband will be used for the interconnection. Data is broken into 1MB chunks and these are pseudo-random distributed across all resources in the frame as well as being mirrored. This is called RAID-X or mirrored protection. The mirror of a chunk never resides on the same module. Chunks that are on one disk are not mirrored to a matching disk in another module (like a RAID mirror) but rather spread across all the other drives in the system. There is potential for data loss if two disks fail but clever maths and some other techniques are used to make this risk very low. Across the 300 [correction:3000] installations world wide there have been no double drive failures. Of course your traditional RAID systems are at risk from a double drive failure in a set too. Of course with XIV the failure domain is wider if two drives were to fail. This is where rebuild speed comes in. If a disk fails only the 1MB chunks it contained need to be re-mirrored. So if the drive was only half full thats half the data to process than a more traditional RAID rebuild. As the data that has to re-mirrored is spread across all the drives in the system, as is the destination of the re-mirroed chunks, all the disks are involved in the read. This means that a re-mirror is really fast. A 1TB drive can be rebuilt in 30 minutes this way, as opposed to sometime up to 24 hours in traditional systems. The bigger your XIV system (more drives) the faster the re-mirror will be. This great rebuild performance is a key advantage to RAID-X as disk drives continue to get larger. No need in XIV to worry about hardware RAID or hot spare drive management. Operation is very simple, the systems takes care of it for you. Licensing for all functions is included up front. You can't discount it. IBM acquired the technology from startup headed by Moshe Yanai who is known as the father of EMC's Symmetrix disk system. Most of the vendors are moving to this commodity hardware and operational simplicity that XIV offers. The smarts is in the software and not the tin or brown spinning stuff. We are seeing more of these grid architectures and chunking of data. Traditional vendors are back filling this into their existing systems, XIV had the luxury of doing it fresh from the get go. XIV looks like storage that does what it does well, but it only does one thing. The nerd knobs don't exist. I suspect that companies that uses XIV are going to be large and that it won't be the only storage sitting on their floor. At an entry point of 27TB usable its no small entry point, so there is going to be some big storage needs. Companies with this amount of data are probably going to have a wider variety of storage requirements, that XIV may not yet handle. 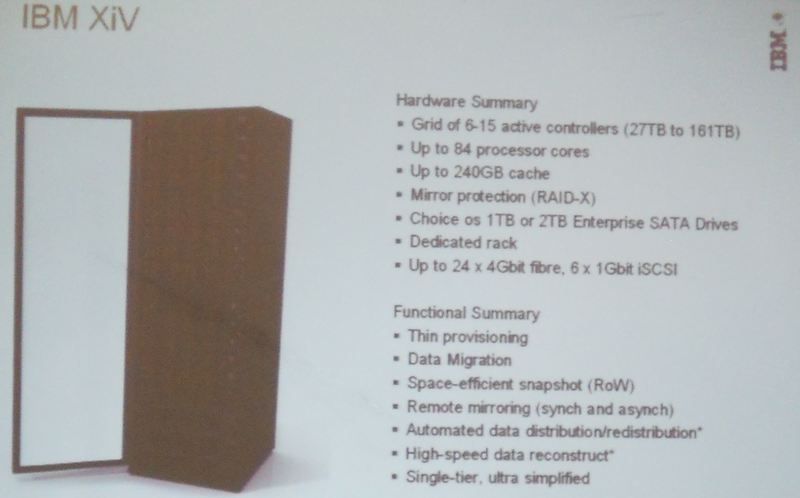 RAID-X sounds lovely but it has two drawbacks. First has the most expensive protection level, mirroring. The price is going to have to be right to compensate for the high overhead. Second, that large failure domain means you are only going to be using this for either scratch data or something you have backed up somewhere else. Yes a single drive can rebuild real fast. But IF (and its a long if) that was to happen, because the chunks are so wide spread you loose more than just the data you might on a single traditional RAID group, or none at all if the second disk was in a different RAID set. With RAID-X you may loose a bit of data from everything across the system. Thats going to be a hard one to recover from, and restoring between 27 to 162 TB of data is not going to be fast. Would like to hear your thoughts on the XIV, post in the comments. Below is the video of Craig taking us through all of this. Craig then went on to go through the new Sorwize V7000. They have taken the best of SVC, added RAID functionality from the DS8000 box, basically merging the two product lines to deliver a new mid-range controller. I won't go into all the details of this. Here is the slide and its covered at the end of the video above, after XIV, if you want to watch it. Craig McKenna gave some details on XIV at the SNIA Australia Blogfest this last week. I caught up with Craig to get a quick run down on some of the things he talked about including the value prop, how data is stored via RAID-X and the technique for rebuild of failed drives. I have the video of the actual presentation so I will process that and put it up so you can see the whole thing. 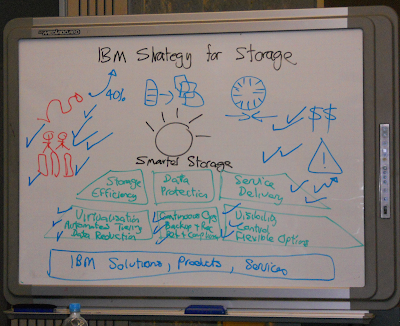 At the SNIA Australia Storage Blogfest, Anna Wells presented the IBM strategy for storage. I previously posted the brief interview we did afterwards. Here is the full video of the presentation, which I thought was very good. I am bit of fan of white boarding a presentation myself so it was great to see someone else doing it. The structure really flowed. Here is the final image drawn up. Here is the version handed out afterwards. 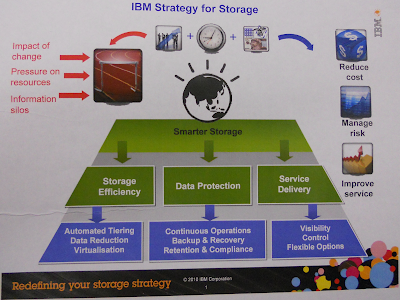 I thought it was good that IBM found in necessary to first present their overall strategy as a place to then reference their products into. In fact a single product might address multiple areas of the strategy. It shows a good consultative approach from a vendor, not all speeds and feeds. Bill Chang, Executive Vice President of Business at SingTel talks in this video on the SingTel Cloud vision along with his views on the Cloud market and NBN in Australia. Worth a watch if you are tracking Cloud in our region. Disclaimer : I earn a living working for one of the subsidiaries of SingTel. 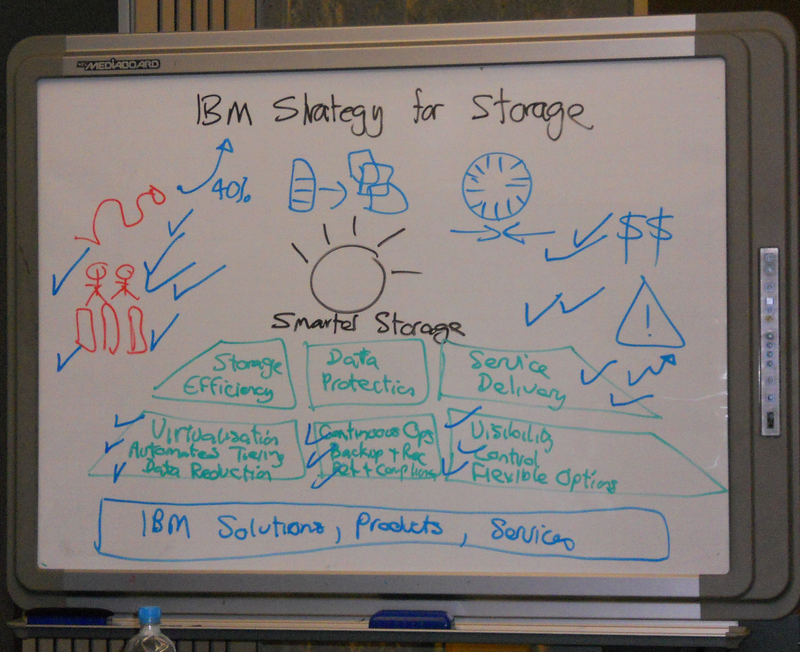 At the SNIA blogfest in Australia, Anna Wells presented the IBM strategy for storage. Anna is the Lead for IBM storage across A/NZ. I caught up with Anna and recorded this quick interview afterwards to get a summary. I will post up later the full video of the presentation. This coming Thursday is the SNIA blogger event which will cover EMC, HDS, IBM and NetApp . Expect to see some tweets, possibly live blogging and some great blog write ups, photos and videos of the event. Update : Justin came up with a sweet hashtag #sniafest, love it.